OCEANSIDE — Tucked inside the city records center along with files, photos and blueprints are 21 oil paintings of Balboa Park, the Del Mar race track, the Golden Gate Bridge and other California landmarks. The city-owned paintings were commissioned in the 1930s and 1950s and were set to receive the council’s OK to be destroyed last Wednesday. City Clerk Zack Beck said he put the item on the Dec. 2 agenda to bring attention to the paintings’ fate. A year ago the city Arts Commission recommended that the paintings be historically photographed and destroyed if a home could not be found for them by April 2015. No home has been found. The council item was pulled from last Wednesday’s agenda by the city manager, and internal city discussions began on what to do next. The paintings are not of extraordinary quality, nor painted by known artists. Emmanuel Osuna, a descendent of Juan Maria Osuna, the first mayor of San Diego, was commissioned to paint more than 16 works in 1938. Dorothy Pennington was paid to paint six scenes in 1952. The collection hung in the public dining hall under the pier, where the lifeguard station is now housed. 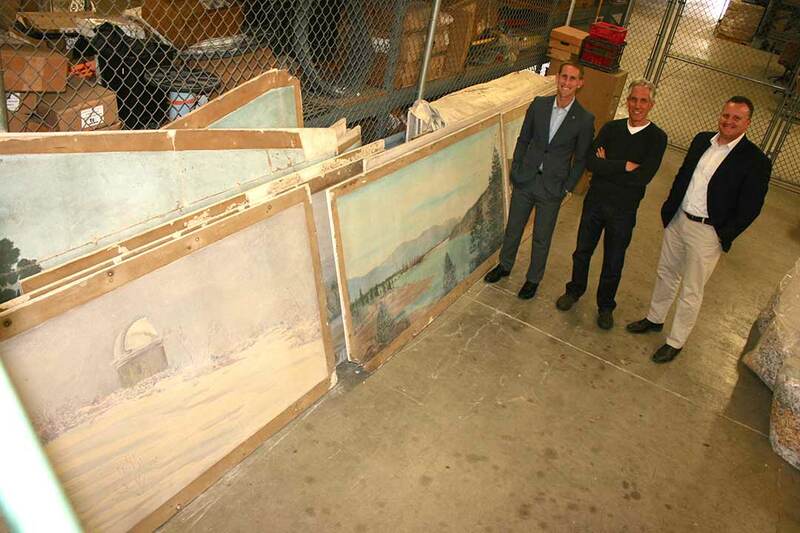 When the facility was remodeled in 1985 the paintings were put into city storage. Works by Osuna were painted on thin board, and backed with plaster when they were moved. This has made them extremely heavy and fragile. The paintings were stored at several city facilities over the years. In 1987 the city restored three of the works including the painting of Mission San Luis Rey that hangs in the City Council chambers. Then in 1990 21 paintings were moved to the newly opened city records center and stored in the climate controlled facility, out of public view. Through the years age and wear has occurred. The city determined it would cost $200,000 to remove the plaster backings and restore the paintings to exhibition quality. There is no interest from dealers, appraisers, Balboa Art Conservation Center, Oceanside Museum of Art or Oceanside Historical Society to take on restoration costs or storage. Beck said he is in discussions with council and staff to determine an out-of-the-box solution to get the paintings into public view. One idea is to sell or donate the paintings to a business or nonprofit that would accept them as is and publicly display them. Beck said he would like to find a home for them in San Diego County. He added the paintings’ value is their quirky, historic and sentimental appeal. Beck said he does not see a need for the collection to be kept together. Some of the works are irregular shapes to custom fit the city dining hall. Others are more standard 7-foot-by-3-foot sizes. Beck said he will work with the City Council and staff to set a policy for the paintings to be acquired, and expects to have guidelines in place by early next year. Tony Arambarri, city records manager, is also contacting the families of the artists to see if they would like the paintings. Thirteen of the paintings have been historically photographed, which allows the works to be reproduced. The council will approve $2,000 to photograph the remainder of paintings at an upcoming meeting. The paintings remain in storage.